A gorgeous home away from home! A truly relaxing place to stay. The villa is well equipped and the beds are comfortable. The pool is a very good size and well maintained. We used this many times at different times of day and it was always at a lovely temperature. The gardens overall are beautiful with the Bougainvillea my particular favourite but the trees add shade to the garden around the pool.The views from the patio and garden across to the mountains change during every part of the day. The stone steps down to the gardens and pool is particularly fragrant. It has the feel of being part of traditional Spain with a modern relaxing house to be in. We thoroughly enjoyed our stay here. There was a welcome pack of food in the fridge when we arrived which was much appreciated. There is parking in the property for two small cars. We love this characterful part of Spain and Orgiva with its eccentric mix of people. Thanks Peter & Kathryn for a fantastic revue. This was a great place for a well-needed family holiday. We were made to feel very welcome by Michael and Helen, who are on hand only if help is required. It's a well equipped house with everything we needed so we didn't get to see them very often. We arrived late in the evening so their kind welcome pack of food and goodies was very appreciated and there were lots of thoughtful touches to make us feel at home. We went with our two sons - 15 & 18 so WiFi was obviously useful, however the beautiful garden was the real highlight. Along with a lovely pool, there's a hammock and lots of lovely shady spots. We relaxed under olive and citrus trees, with great views of the mountains in all directions. It's a very special place, very 'Garden of Eden' like. We went into Orgiva a couple of times to eat; its easy to find reasonable prices and good food. The pizzeria is very good. There is a good supermarket, but is closed on a Sunday. The butchers and fruit and veg shop seem to be open every day. In the heat of summer we did not feel like venturing too far however there seems to be lots to do and see in the local area. We've been lucky and stayed in a number of great home and away villas but this is the most tranquil spot we've found to date. Our noisiest neighbours were a donkey and a herd of goats. Thanks Michael and Helen for sharing this wonderful place. Thanks Mark & Allison for a great revue! We highly recommend this villa to anyone who loves nature, beauty and tranquility! It is very peaceful and far enough away from Orgiva (Orgiva was not really for us but does have everything you need ie shops, restaurants, bakeries!) You will need a car for sure but it is possible to walk from the villa along the road and up along the hillside-it is stunning, we hope to return and thank Michael for his mindful unobstrusive hospitality. We have just spent two wonderful weeks here and really didn't want to leave. The villa was perfect for our needs with a well-appointed kitchen, a comfortable larger-than-double bed in the main bedroom and plenty of living space inside. We loved the outside, snoozing on the sheltered terrace or relaxing in the flower-filled garden, surrounded by mature fruit trees (we enjoyed fresh figs every day) with plenty of lawn space. There's a covered patio and plenty of sun beds if you want to sunbathe or enjoy the private swimming pool which was a little chilly in October but lovely for a brief dip. The crowning glory is the panoramic view across the valley floor towards the Sierra de Lujar mountains. We loved the constantly changing view in different light and weather conditions and never tired of staring at the stunning scenery. We were lucky enough to see it during the full moon - magical! A car is essential, even if it is just to get to and from Orgiva where there are several small supermarkets which, between them, provide all food requirements. There is also a market every Thursday offering plenty of fresh fruit and veg plus spices, nuts, shoes and clothes - and an opportunity to practice your Spanish! There are many bars and restaurants in the town too but we can't offer any information on these as we were very happy to eat our own-cooked meals every night whilst enjoying the breathtaking view from the terrace. 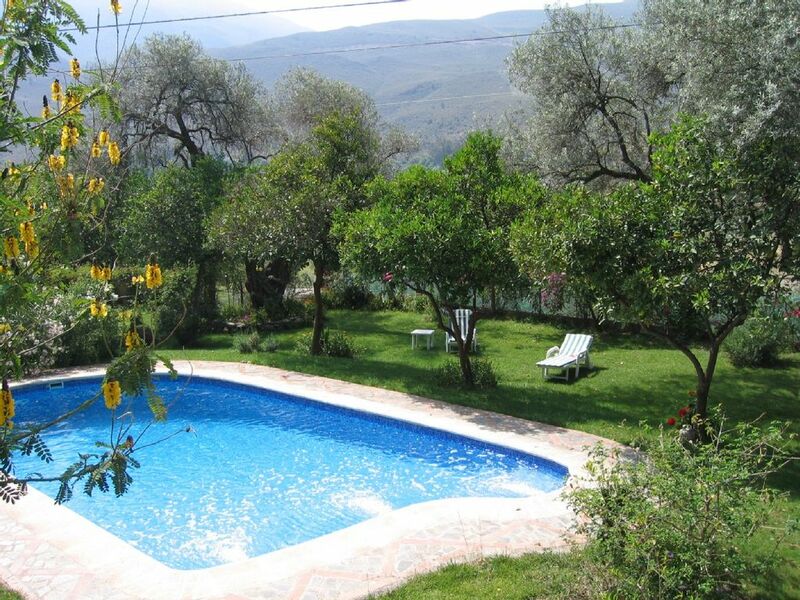 The location is perfect for exploring the Alpujarras region and beyond. However we chose to spend most of our time walking the numerous paths in and around the valley, soaking up the sights, smells and sounds of this magnificent countryside. Michael and Helen were the perfect hosts, always available if needed, but otherwise discrete and inconspicuous. We have no hesitation in thoroughly recommending this accommodation. Thanks Sue & Martin, we are delighted that you enjoyed your stay and hope to see you both again! Best wishes Michael & Helen. The accommodations are spotlessly clean and appointed including furnishings that fit in perfectly with the Spanish villa. The pool is huge and very beautiful with fresh orange and lemon trees that produce a fresh sent and have a delicious flavor. We saw the Alhambra, I played golf at Santa Clara and dined at the Marina. We also brought our 2 boys from Florida to the Sierra Nevada during the summer to have them see snow for their first time. The best part of the vacation was the Villa itself. Its completely peaceful, the views are breathtaking, its the most relaxed I have ever been on holiday and I would highly recommend this villa with all of its spectacular amenities to everyone. Das Haus ist sehr groß, absolut ruhig gelegen, die äußerst freundlichen und großzügigen Vermieter sind nicht zu spüren aber stets zur Stelle wenn man Hilfe braucht. Es fehlt an nichts. Das Grundstück ist traumhaft und sehr gepflegt. Orgiva ist ein perfekter Ausgangspunkt für Ausflüge in die Alpujarras, nach Granada oder ans Mittelmeer. Sehr zu empfehlen. Thanks Monika, hope to see you again. The villa is located 4 km form the market town of Orgiva where you will find all amenities. In the local area there is walking, horse-riding, quad biking, birdwatching, climbing, paragliding, fishing. The coast is 30 minutes away and the Alhambra and Granada is only an hour away.The highest inhabited village in mainland Spain is only half and hour away. Prices quoted are for 4 people, we can accept up to 6 people, please contact me for rates.